Home | Forensic Chemistry, B.S. -- Providing a high-quality and comprehensive curriculum wherein students can acquire the knowledge, skills, and experiences necessary for success in their chosen field. Forensic scientists work in morgues, laboratories, court settings and police departments. They are employed by local, state and federal government agencies; public and private universities; medical examiner offices; forensic and medical laboratories; hospitals; law firms; police departments and a growing number of private companies. They can also be self-employed as consultants to courts, law enforcement agencies, university-based research laboratories, law firms and medical examiner offices. According to the survey of the American Academy for Forensic Sciences (AAFS) in 2004, more than 10,000 job opportunities in the field of forensic science are expected over the next decade to address an expanding case backlog. Although employment rates will differ regionally, and depend on national and statewide funding, local populations and state crime rates, employment opportunities will always exist. The expected employment opportunities for forensic scientists can, in part, be driven by the continued scientific and technological advances. New methods and instrumentation for the chemical/biological sciences have created unprecedented and revolutionary opportunities to collect and examine criminal evidence. This has created backlogs in forensic laboratories, particularly in DNA analyses. The need for an adequate supply of trained forensic scientists to perform complex analyses is a significant challenge for forensic laboratories. Newly trained forensic scientists from our program will have learned about the concepts and instrumentation underlying the technologies that will be the future of forensic science, while developing an understanding of the practical issues related to the analysis of evidence is performed in a professional, timely manner. Our program offers rigorous training in the theories and practical aspects of chemistry, with a focus on analytical techniques, and contributes to the development of both the practical aspects of forensic practice, as well as the training of future forensic practitioners. This program also meets the requirements for certification by the American Chemical Society, and as such, fully prepares students to enter a professional career not only in forensic science, but also in analytical chemistry, with direct relevance to any prospective employment positions requiring the precision and performance associated with forensic chemistry techniques. -- Drugs, toxicology, firearms, trace, DNA, arson, etc. Your success in our forensic chemistry program can benefit greatly from forensic internships, volunteer programs, and research programs during your time in school. Such opportunities can provide you with an introduction to the forensic careers available and help you get hands-on experience working beside an experienced crime scene investigator. These experiences can pay off in the form of a better education and lead to rewarding forensic jobs. It will be to your advantage to begin investigating some of the following opportunities early in your forensic education. 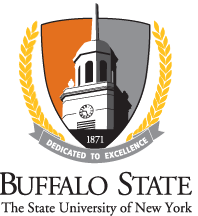 Students in the forensic chemistry program must enroll internship (FOR412) that will give them an additional training in professional local forensic laboratories such as Erie County Central Police Services, Erie County Medical Examiners Office, and Niagara County Sheriff's Office. Internships are generally unpaid. Important Note: Internships for some places may require background checks similar to those listed above. Individuals seeking employment in a forensic science laboratory may be required to undergo an extensive background check including a lie detector test, fingerprinting, and drug testing.